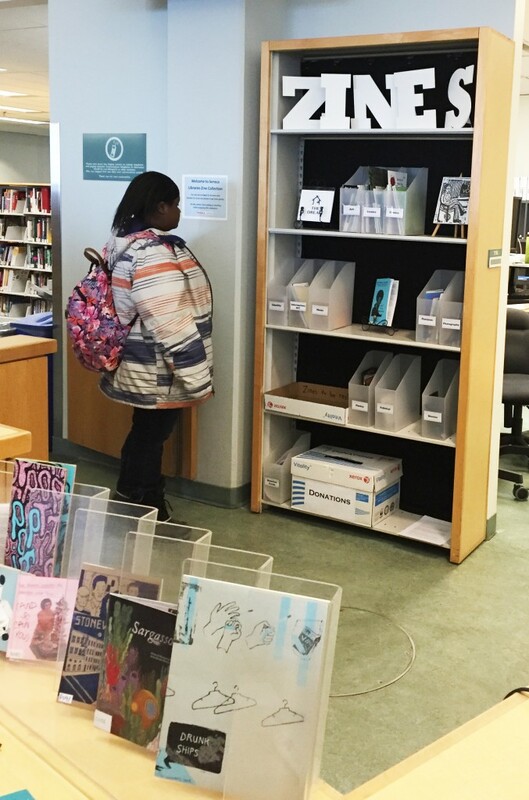 Seneca Independent Illustration » Zines now in Seneca Library! For the past few months, the School of Creative Arts and Animation, the Independent Illustration program and Seneca Libraries have been working together to launch a new Zine collection at Seneca@York Library. Zines are self-published texts motivated by the desire for self-expression and the library’s collection of 140 titles includes a mix of purchased works as well as zines created by Seneca students. This collection will continue to grow through ongoing donations from Seneca students, both individual works and group-created zines. The zine collection launch was held on January 22 in the Seneca@York library. During this event, students and faculty had a chance to peruse the collection and participate in a zine-making workshop. The workshop, designed by faculty member Martha Newbigging, was delivered by 4th semester Illustration student Jess Sheridan. Faculty members, JoAnn Purcell and Martha Newbigging, from Independent Illustration collaborated with Librarians Joanna Blair and Lydia Tsai to build the collection and make it available to the Seneca community.